MAKATI City– In preparation for the upcoming Listahanan 3rd Round Household Assessment this year, the Department of Social Welfare and Development (DSWD) MIMAROPA has organized a Stakeholders’ Forum on February 8, 2019, for the Provinces of MIMAROPA Region. The objective of the said forum is to establish commitment among the Listahanan stakeholders particularly on the four phases of project implementation. This commitment setting between the DSWD and Listahanan partners is to ensure that the integrity of the database cannot be compromised due to various political or personal interventions of the DSWD field workers and even prominent personalities or institutions in the localities. As such, DSWD partners also expressed their commitment by posting Listahanan advocacy tarpaulins in their respective offices once the household assessment kicks-off for the public awareness and community participation. In this Listahanan 3, there are 622,230 target households (HHs) for assessment, of which 95,122 HHs for Occidental Mindoro province; 186,616 HHs in Oriental Mindoro; 50,618 HHs in Marinduque; 65,436 HHs in Romblon; and 224,438 HHs in Palawan. The target HHs are based on the result of the 2015 HHs Assessment and the 2015 official census of population by the PSA. Listahanan is a government mechanism that identifies who and where the poor are nationwide where the national database of poor HHs are being updated every four years as mandated by executive order 867. The first round of household assessment was conducted in 2009 and the second assessment was in 2015. MANILA City- The Department of Social Welfare and Development (DSWD) MIMAROPA through the Listahanan recently conducted the first Data Protection Officers (DPO) regional conference on February 6-7, 2019, along with the department’s data sharing protocols. The regional DPO conference, in coordination with the National Privacy Commission (NPC), aims to orient the LISTAHANAN MIMAROPA partner stakeholders on salient provisions of the Data Privacy Act of 2012, enhance the data sharing mechanisms of LISTAHANAN, and assist the Listahanan partners in registration to the NPC DPO register. Atty. Ivy Grace Villasoto of NPC emphasized that “Data Privacy Act or Republic Act No. 10173 protects individual personal information stored in information and communications systems of the government and the private sector. It aims to protect the fundamental human right to privacy while ensuring the free flow of information to promote innovation and growth”. NPC clarified that this does not limit the mobilization of people, instead, it inculcates the value of privacy in the government setting in the county. The Regional DPO Conference is the first in the entire DSWD to call all DPOs for massive registration for the increased buy-in of Listahanan Database through the enhancement of Data Sharing Agreement, in which appointing of Data Protection Officer or DPO is one of the pre-requisite requirement in compliance with the privacy act. RA 10173 defines personal information as any recorded information that would reveal the identity of an individual while sensitive personal information refers to an individual’s race, ethnic origin, marital status, age, color, and religious, philosophical or political affiliations, health, education, sexual life of a person, offenses, government-issued identification cards/numbers, and other classified information due to legal pronouncement. Being one of the government agencies that process various sensitive and personal information of Filipinos benefitting various social protection programs, the DSWD wants to ensure the security of its systems. “We at the government would like to preserve all information in the principle of confidentiality. Thus, the Listahanan Memorandum of Agreement (MOA) is our mechanism to safeguard sensitive and personal information in compliance with the data privacy act,” said former DSWD MIMAROPA Director Wilma D. Naviamos. Listahanan MOA is a requirement in the data sharing guidelines to all partners who wish to access the list of poor households. The NPC also cited other five requirements in order to become privacy compliant (1) Appoint a Data Protection Officer who will ensure the organization’s compliance with data privacy and security laws and regulations and also plans, implements, and evaluates policies for data privacy and security. ; (2) Conduct a Privacy Impact Assessment; (3) Create a Privacy Manual; (4) Implement Privacy and Data Protection Measure; and (5) Exercise Breach Reporting Procedures. Mga representante mula sa iba’t ibang sangay ng pamhalaan at sektor ng lipunan. ODIONGAN ROMBLON- Kinilala ng Department of Social Welfare and Development (DSWD) – MIMAROPA Region ang ilang stakeholders at partners nito sa pamamagitan ng 2018 Gawad Listahanan na ginanap sa nasabing bayan nitong Martes, November 27. Ang mga nasabing parangal at pagkilala na ibinigay ng DSWD-MIMAROPA ay bilang pasasalamat sa walang sawang pagsuporta sa mga awardee sa Listatahan database at iba pang proyekto ng nasabing departamento. Ilan sa mga kinilala ng DSWD-MIMAROPA ay ang local government units ng Puerto Galera sa Oriental Mindoro; Brooke’s Point at Rizal sa Palawan; at ang Provincial Government ng Romblon dahil sa commitment ng mga ito sa DSWD na gamitin ang Listahanan databse. Kinilala rin ang Philippine Statistics Authority-MIMAROPA, National Economic and Development Authority-MIMAROPA, at Philippine Health Insurance Corporation-MIMAROPA bilang pinaka-supportive na National Government Agency sa buong MIMAROPA. Samantala, ang Romblon State University, Marinduque State College, Occidental Mindoro State College, Mindoro State College of Agriculture and Technology, Divine Word College of Calapan, Palawan State University – PPC Campus, Western Philippines University – Aborlan Campus, ay kinilala rin ng Department of Social Welfare and Development – MIMAROPA dahil sa suporta ng mga ito sa ginanap na 2015 Listahanan road show sa kanilang mga campus. 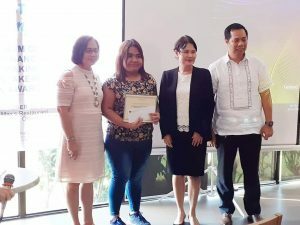 Pinarangalan rin ng DSWD-MIMAROPA ang Romblon News Network bilang Best Online Media Network sa MIMAROPA, dahil sa pagtulong nito sa departamento na ipaalam sa publiko ang mga programa, aktibidad, at accomplishments ng mga ito. Gayun rin ang government media na binubuo ng Philippine Information Agency – Romblon, Philippine Information Agency – Palawan, Philippine Information Agency – Oriental Mindoro, Radyo Pilipinas – Palawan, at Philippine News Agency – Palawan. Samantala, kinilala rin bilang Romblon’s best Convergence Initiatives ang Municipal Action Team (MAT) ng bayan ng Odiongan, samantalang first runner-up ang MAT ng bayan ng Ferrol, sinundan ng MAT ng bayan ng Magdiwang at MAT ng bayan ng Santa Fe. Ang Listahanan o kilala ring National Household Targeting System for Poverty Reduction (NHTS-PR) ay isang information management system kung saan pwedeng malaman ang mga miyembro ng poorest sector at kanilang mga lugar. Malaking tulong umano ito sa national government agencies, at local government units sa pagtukoy ng posible nilang beneficiaries sa kanilang mga programa.